The Reward Fleet is one of Miami’s oldest and most recognized charter fishing party boats. We run at least 3 trips daily (morning, afternoon and evening) out of Bayside Marketplace Marina in Miami. All trips depart Miami through its main ship channel – Government Cut. Because of our location, it only takes a few short minutes to reach the fishing grounds off Miami. 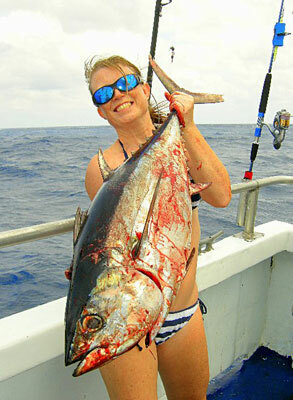 We usually fish the local reefs , ledges, drop-offs and wrecks in search of a variety of species – from bottom fish like snappers and groupers, to reef and wreck dwellers like amberjack and kingfish, even pelagic fish like sailfish and tuna are very common. Fishing methods will vary depending on conditions and time of year, but be assured the captains of the Reward fishing fleet will do everything possible to put you on the fish and have great time while you’re aboard. Sometimes we’ll anchor and chum, sometimes we’ll drift while live-baiting and jigging, and if conditions permit, we’ll even put a fishing kite. Usually, 20 lb. tackle is all that is needed for live-baiting and jigging. Heavy tackle can be used if you plan on fishing baits on the bottom. Trolling is also allowed and stern spots are shared between drifts. If you don’t have your own tackle, no worries, tackle is available at no additional cost. Equipment: If you bring your own equipment, please limit to 4 outfits. Some outfits will be available at no additional charge. Also, there is no additional charge for live bait, special hooks, lead or leaders.